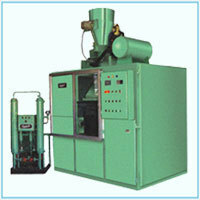 >Ganesh Quality Machines Pvt. Ltd. 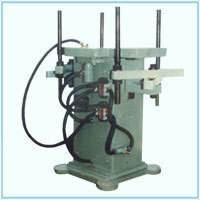 Manufacturer of tiltable gravity die casting machine, cupola charger, deck siever etc. 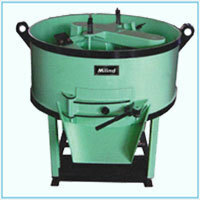 Ganesh intensive sand mixer is specially designed for mixing core sand and similar materials. The s type impellers are fabricated and hard spot welded. The wear plates are exchangeable. Pneumatic door opening is provided. This is advanced design for big and small foundries.The breakers are also provided to break the heterogeneous mass. Ganesh co2 sand mixers and Ganesh no-bake sand mixers are also available. 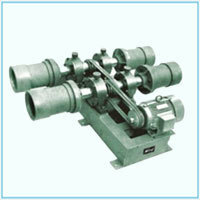 Ganesh centrifugal casting machine has won the most prestigious Parakhe award of 1987. This is most popular design for large production of centrifugal liner. The main die is driven through v belt. The coating of shell sand is made in sleeve in which liner metal is poured. By this machine good quality of liner is obtained. Ganesh Gravity die casting machine is specialized for nonferrous metals like aluminum, lead and copper alloys with wide range of options available to meet the need of foundries. The machine is a "C" Frame type structure, fabricated out of steel plates with one fixed plate and one moving plate guided by four rear guide bars made up of hard coated chrome bars and supported by bottom slides to take heavy die weight. 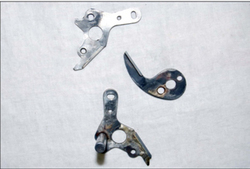 Both plates are provided with core extractor or ejection of the castings. a. PLC controlled automatic type push buttons. b. Tilting speed can be controlled manually by adjusting flow control valve. ganesh pneumatic moulding machine or hydropneumatic moulding machine is a modified version of pin lift hand moulding machine. 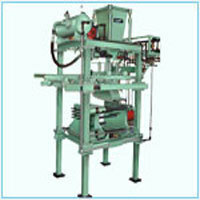 Ganesh has designed this machine specifically to reduce the operator fatigue in lifting heavy molds. 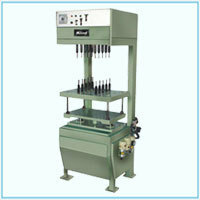 This machine gives added advantages of costly pneumatic moulding machine in minimal cost. This is proven design. 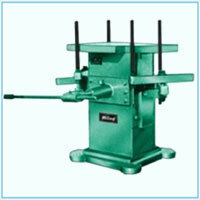 This machine is used in small and medium foundries where ramming is manual. • Capacity: 1 ton- 10 ton per hour. 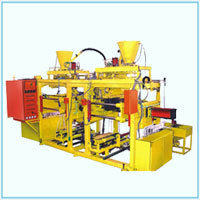 Ganesh shell moulding machine has made a revolutionary change in shell moulding production. 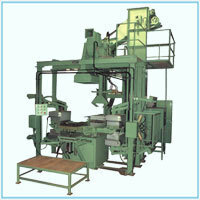 We are Indians largest manufacturer and exporter of four station shell moulding machine. 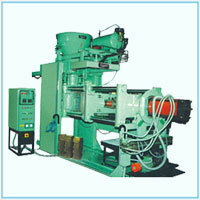 Four stations automatic shell moulding machine is designed precisely and constructed for the huge production of moulds. 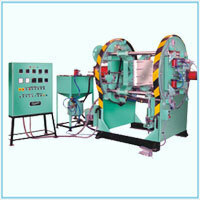 The machine consists of square rotary tables and one match plate on each side of square. The rotation consists of fast speed and slow speed with brake system controlled by limit switches. In the four stations, the sub stations are: investment, preheating, after heating and ejection .Only one operator is required to operate the machine. 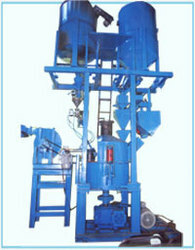 The bucket elevator is installed on one side of the machine in which the sand is elevated to the top hopper for sieving. Below the top seiver hopper is mounted, with pneumatically operated butterfly valve. • Cycle time: 50 sec/shell approx. 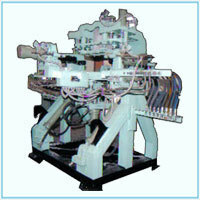 • Special cooling arrangement for core box is provided. • this process is most suitable for atomization. this is a vertical parting with turn over top blow. Swing door operation enables easy ejection of core from corebox. this automatic shell core shooter is a top shooting type. Vertical parting line. Roll over type design, minimum lead time, and increased production. This design has vertical parting line, top shooting rollover type enabling self hollow cores. 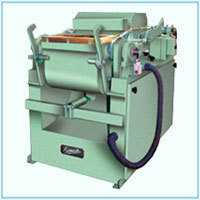 Available in manual, semi automatic and fully automatic with auto sand feeding arrangement. 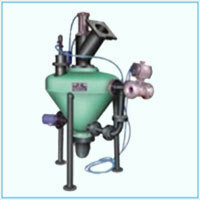 • Lump breaker is specially designed to break the lumps and reduce it into small sand particles. • Loose sand and lumps from demolding equipment are fed into lumpbreakers. • This machine helps the small foundries for mechanical sand reclamation process. 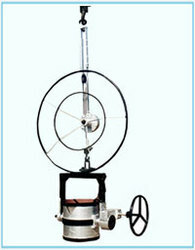 Our portable sand aerator is most useful in all foundries to give high flowability to sand. The sand is sheared by strips mounted on endless belts. 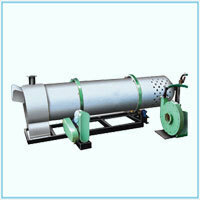 The drum is rotated in ball bearings so as to give smooth operation. The sand is fed in hopper and then it passes on endless belt which throws away with high speed. 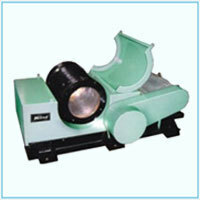 • Ganesh hot blast cupola is designed considering all points of Indian standards. • Cupola design gives maximum melting with minimum fuel combustion. • Single and double lining cupola design is available as per requirement. • Industrial blowers are available with different capacities. Sand blast is much more useful to clean casting surface. The valve is connected to compressor air. When air flows through valve it draws fine sand from tank and shoot the casting surface. The inner part of valves and nozzles are hardened to increase life. This is the best design to clean the casting surface.To follow the environmental norms we manufacture special cabinet type sand blasting machine. 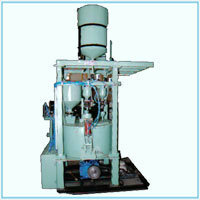 • Ganesh shot blasting machine is a robust machine suitable for surface treatment. • It is helpful for those work pieces which are not suitable for tumbling type because of their shape and sizes. • These are specially designed to suit the customer requirement. • The blast cleaning chambers are lined with highly wear resistant material. • Very short loading and unloading time. • The specially designed blast stream to clean all surface. 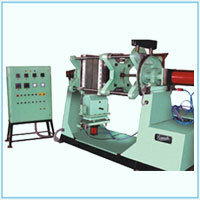 Our simultaneous jolt squeeze molding machine is a sturdy design. 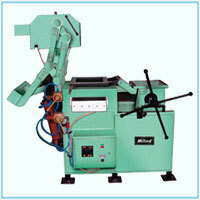 It produces uniform and high hardness mold with its simultaneous jolt squeeze technology. All parts are made of s.g.iron castings.Powerful impact jolting with high dynamic squeeze force for uniform and rigid molds. Our bucket elevator is a proven design. Sturdy design, minimum maintenance, long life, maximum efficiency is some of the salient features.Buckets are fabricated and hard spot welded to have high wear life. Bucket elevators are available in fixed as well as portable type design. 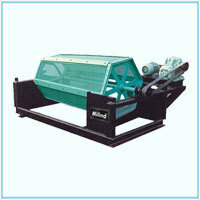 Core blower is specially designed to shoot the sand in the complicated shape of pattern. 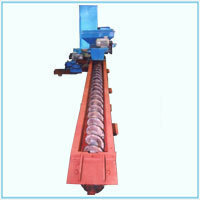 This machine cuts down the cost of shell core as the hollow cores can be easily obtained. Keep heated pattern on blow orifice coinciding with pattern passage. This machine is pneumatically operated. Ganesh rotary sand drier is specially designed to improve the quality of sand which ultimately reflects in quality and economy of castings. 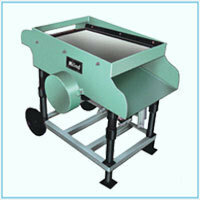 Moisture is removed from sand effectively.Ganesh sand drier is sturdy in design and rigid in construction. 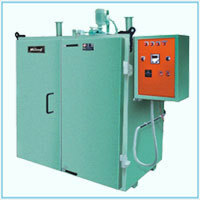 The drum body is specially designed to withstand high temperature of firing unit. To avoid the heat loss drum is wrapped with asbestos sheet. 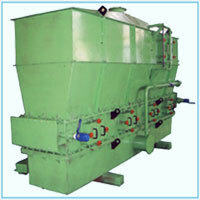 This machine is designed to for maximum sand drying capacity in minimum time. 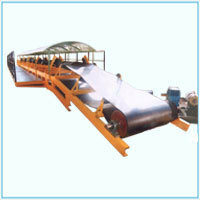 The sand is conveyed from one side to other with fin type screw conveyor. The drum is rotated on rollers. Requires less floor space and minimum oil consumption. 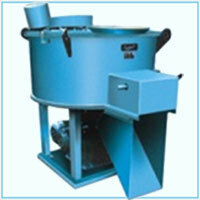 Cone type sand drier and double drum type sand drier are also available. 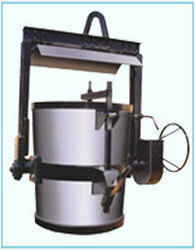 Ganesh drum type sand Siever is intensively used in large and medium type foundry.The drum is fabricated and mounted on two rigid frames. The drum is wrapped with required M.S. 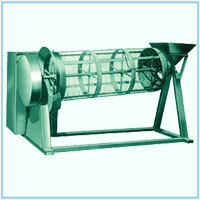 mesh sieve. Sieve is replaceable. • Accessories: auto sand charging system, automatic cycle control, carbide tipped scraper blades, linings for drums, sand aerator. 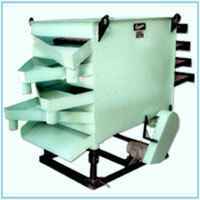 • Ganesh sand mullers are provided with sand aerator, sand charging system, carbide blades and S.S. linings. Capacity 50 kgs to 1 ton. 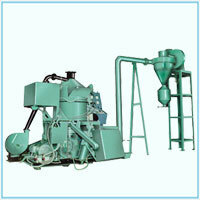 Ganesh has taken plunge to Automize the existing Sand Muller into highly productive one. 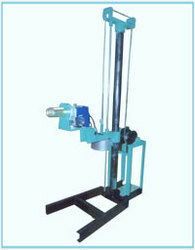 ganesh pin lift hand moulding machine is rigid in construction and easy in operation. This is very popular in small and large foundries due to flexibility of shifting at any place. The minimum force is required for lifting due to special lever type design. • lifting height 6", 8", 10"
• mould box size : 12" x 14" to 24" x 32"
Ganesh electrical core oven is a popular model since the scarcity of electricity. Heaters are mounted in well designed position in oven on two sides. The sturdy trays compartments are provided to place cores. The oven is completely insulated by glass wool. The design protects heat loss with outside environment. Temperature indicator is provided. The oven gets off after reaching the desired temp hence overbaking or underbaking is avoided. The circular fan is provided for uniform temperature distribution. Ganesh Quality Machine has taken a plunge in the automation of existing foundry equipments right from the Muller, mixer to the automation of sand coating plants. We offer customized solution to your foundry considering your requirement. We have already automized many equipment to reduce the dependability over manpower. We undertake the projects such as automation of intensive mixer, sand mixers, sand mullers, molding lines sand coating plants with batching system, automatic sand weighing and batching system. • Export to many countries. • Batch capacity: 70 kg to 350 kg. • Capacity - 50, 70, 100, 150, 200, & 300 kg. • Plant consists, Mixer Chamber with 'S' type blades, Hot air chamber with Blower, vibrating screen, cyclone to collect coated sand & to remove fine dust and control panel for fully automatic operation cycle. • Optional Heating : Electrical, LPG, Diesel etc. Sand charger helps to reduce human effort and helps to automize the normal Muller into highly productive one. We design custom sand charging process. • Cupola charger is designed to convey the material from floor level to the platform of cupola. • The system consists of motor, gearbox and brake system. • When the power supply falls brake prevents bucket from falling down rapidly. • The cupola charger will reduce the man power dependency and improves conveying rate.